There are inevitably pieces of life that frame and help define how you see the world from that point forward. These parts of life may seem, at the time, fleeting, insignificant, or even obstacles one must simply and quickly overcome to move on and forget ever happened. It is one thing to live out these moments internally; to go through the ins and outs of each day, moving forward whether you like it or not. But it’s an entirely different experience to watch these moments unravel from an outsider’s point of view in a context you never knew existed. To be honest with you, being part of The First Patient seemed pretty insignificant when I signed the film release. It was effortless; another box to check; another I to dot. I thought, seven weeks of my life would come and go and I’d get through whatever happened, good or bad. But this period in my life ended up being very different than I imagined; and different still when I relived it through the film. Watching myself and my peers experience Anatomy again was as if I was seeing this snippet in time for the very first time. In the past, I had the storyboard memorized. Being involved in film production myself, I knew exactly what clips were coming, what edits had been made, and knew “the experience” inside and out. But this time I sat at the edge of my seat throughout the entire film. Was that really how we felt, how we looked, how we responded? What would we discover next? How would the next moments and days shape us? Anatomy serves many purposes in the training of a medical student. The most obvious is to teach you the intricacies of the human body; where the genitofemoral nerve is; what the maxillary sinus looks like from the inside. The second is teamwork; learning to work alongside three others [and effectively 51 others] for the duration of 7 weeks, digging yourselves out of the immense amount of knowledge that must be learned—together. But I didn’t realize at the time or even until I watched this film, which so eloquently portrayed our lives at that time, what anatomy actually teaches you most: reverence and compartmentalization. Through dissecting the masseter, the platysma, the gastrocnemius, we were instilled with an awe of the human body. This awe and respect that I learned from my first patient hasn’t left me and I pray never will. 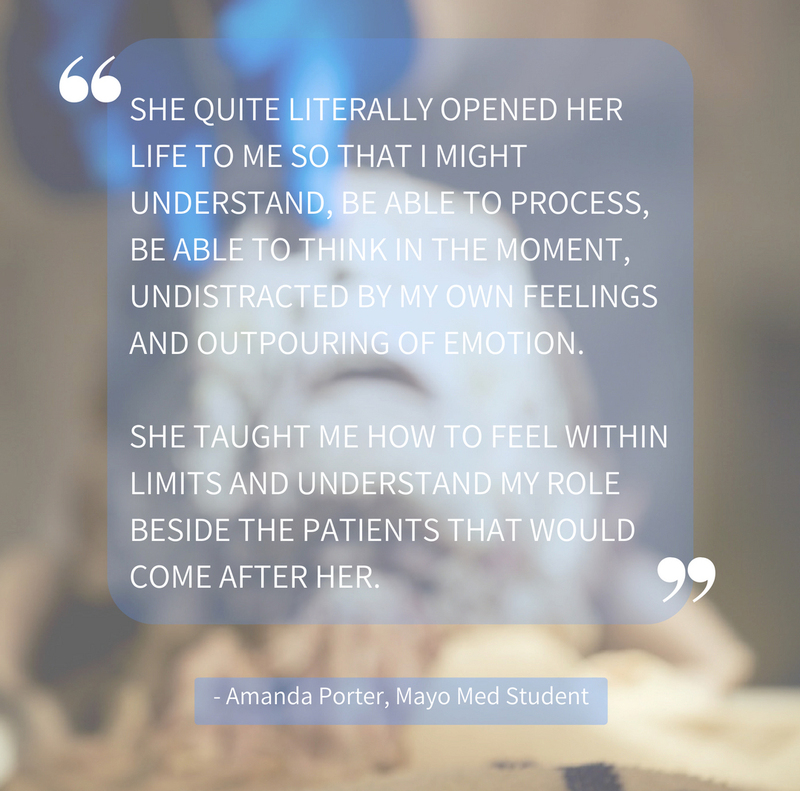 But she also taught me how to step away; how to isolate the semblance of myself from my emotion, a skill that I use every day when working with living, breathing patients and their families. She taught me what it means to be a respectful learner, but also the capacity and ability I have to be a respectful teacher. She quite literally opened her life to me so that I might understand, be able to process, be able to think in the moment, undistracted by my own feelings and outpouring of emotion. She taught me how to feel within limits and understand my role beside the patients that would come after her. All this she gave me after her physical heart stopped beating, her last breath had faded away. There are inevitably pieces of life that frame and help define how you see the world from that point forward. Though I had taken snapshots in my mind, framed them, and put them away on a shelf somewhere to be dusted off in the years to come, The First Patient allowed me a new definition of our experiences. We grew, we were who we were, we loved and cried, got hungry from formaldehyde; and we each wrote our own definition of ourselves within those 7 weeks. A definition that we now shape, mold, and rescript as we move forward and continue to experience and digest what our patients continually give to us as we care for them. For this, and for so much more, I will be forever grateful. See Amanda in THE FIRST PATIENT premiering October 20th. Ticket info Here. Next Post: The Study Of Anatomy Is A Privilege by James S. Leaman, D.D.S.